Where’s the apocalypse: With all the forecasts of doom, is this it? Global Lament is rising for the small brown rat (Melomys rubicola) lost off a desert island no one heard of til morning tea today. This is a rat that was only recognised as a distinct species in 1995, though even then, it was debated, and the rat’s existence was hanging by a thread. The island is a 5 hectare sand spit with a bit of low scrub and an old rusty scaffold once called a lighthouse. So it’s all of 0.05 square kilometers: it is so small there is no fresh water on the island, just the odd puddle after it rains. It’s all so ephemeral that over a decade or so the island shrank 40% and the vegetation was wiped out by 97% (details below). Life on shifting sands in the Torres Strait is all pathetically desperate. It’s 200km off Queensland but only 50km from Papua New Guinea and the highest point (if you could call it that) is 3m about the high tide mark. In other words, any decent wave could have washed the last one off. It’s sad, but it’s not “climate change”. Latch Report, Recovery Plan for the Bramble Cay 2008 EPA, Government of Queensland. No one is quite sure how the brown rats got there, some researchers ambitiously speculate that they might be a relic of the old Australian-PNG land bridge. That would mean they miraculously survived there for 9,000 years through super cyclones, tsunamis and surges. On the other hand, the same researchers suggest they might have drifted on a log from Fly River in PNG, or just hopped off a fishing boat that anchors nearby. No one really knows. Perhaps a cat hopped off a fishing boat too? What’s the chance that sandspit may have been wiped out and rebuilt many times and then repopulated — apparently even whole palm trees are washed up from Papua New Guinea. These cays are geologically temporary features of considerable instability, which may respond dramatically to fluctuations in their environment (Gourlay 1983). This inherent instability is well documented elsewhere, for example Green Island near Cairns has a long history of shoreline construction and erosion (Baxter 1990). The rat’s demise was known in 2016, but it’s re-demise is hitting the news again. It’s a zombie extinction on the second run because an Australian Minister mentioned in one line of a press release that it was now formally and officially “Extinct”. Seven other mammallian critters were apparently rescued from death row in the same press release. No one cared. The Tammar Wallaby was listed as Extinct, but now is now listed as “Not listed” which sounds sinister, except it’s fine –it’s not even categorized as “Vulnerable”. We thought it was dead, but there were some in New Zealand (taken there by an Australian Governor). [ABC] For thousands of years, generations of Melomys rubicola lived and bred on a sandy bank in the Torres Strait known as Bramble Cay. Some time between 2009 and 2014 the last of this species died; probably drowned in a storm surge. Scientists say there is a chance that an identical or similar species could yet be discovered in PNG. But they’re uncertain because PNG’s nearby Key River region has been little documented by research. Australia has one of the world’s highest rates of animal extinction, says the International Union for Conservation of Nature. The ABC rolls out the predictable “not cute enough to save” excuse to explain our careless failure as a nation. It’s as if Australians have all the maturity of the average three year old and only rescue stuffed toys. Unlike koalas or whales, the small rodent was never cute enough to rate much of a conservation effort. It’s only with its extinction – noted for the first time by the Federal Government, in a press release from Environment Minister Melissa Price – that it’s attracted interest from beyond the circle of biologists and conservationists that warned of its demise. Sure, rats are not cute and rescuable like Great White Sharks and Saltwater Crocs are. Will the national self flagellation never end? Australians will give our firstborns to a tiger shark rather than kill it for fish and chips but that doesn’t stop the ABC from implying we are all selfish and immature. Lordy, we didn’t spend millions to save it, nor did we rush up to the distant cay and adopt these rats as pets. Though if we had done that and actually saved one, we’d have been breaking the law. Almost the whole island is protected by the Native Title Act. A lot of good it did the dead rats. So what about the odds that your car exhaust killed the last rat? Euan Mearns savaged this last time around when it first became extinct in 2016. Firstly, we’re not even 100% certain it’s extinct. Secondly, there is no evidence linking it’s demise to man made CO2. Thirdly, it’s in a major cyclone zone where storm surges have happened many times and lately cyclone trends are declining in Australia. Fourthly, the small temperature increase is nothing, seriously, are we kidding? Euan Mearns found a UQ report showing that fully half the islands meagre vegetation was stripped by storm surges from 2004 to 2011. Worse, they way I read it, by 2014 the Cay itself had shrunk to 2.5 ha from 4 ha. The vegetation had suffered a catastrophic 97% loss. As Commenter Roger Andrews says there sometimes whole palms trees wash up on Bramble Cay. There has been speculation that the species may also occur on other islands in the Torres Strait or in Papua New Guinea (PNG), given the close proximity of the cay to the mouth of the Fly River, which regularly deposits large amounts of debris (e.g., logs and assorted driftwood, whole palm trees and other vegetation) on Bramble Cay. 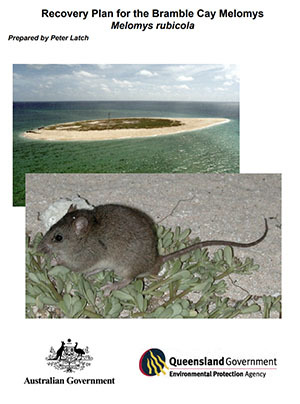 Further survey work on these islands and PNG, along with clarification of the taxonomic status of the Bramble Cay melomys in relation to PNG species, is required (Latch 2008). Bramble Cay melomys is recognised as a distinct species (Strahan 1995) despite some uncertainty about the designation of species within the Melomys genus (Flannery 1995, Dickman et al. 2000). Menzies (1996) in his systematic revision of the Melomys in PNG did not assess Melomys rubicola despite its close proximity to PNG. Dennis and Storch (1998) reassessed its taxonomic status on both morphological and genetic grounds and found that M. rubicola is the most morphologically distinct melomys in Australia based on discriminate analysis of a number of features. They also found that M. rubicola has a distinct mtDNA gene sequence when compared to other Australian melomys. While the genetic differences between mtDNA sequences cannot prescribe specific status unequivically, it was concluded that if they do indicate that M. cervinipes, M. capensis and M. burtoni are distinct species, then M. rubicola should also be recognised as a distinct species. What’s the difference between weather and climate? If the world stops warming for 15 or 20 years that’s “not” climate change, but if a weekend storm surge wipes out a rat, living precariously on a sand bar it’s The First Mammal Extinction caused by your car. Give us your money. Latch, P. 2008. Recovery Plan for the Bramble Cay Melomys Melomys rubicola. Report to Department of the Environment, Water, Heritage and the Arts, Canberra. Environmental Protection Agency, Brisbane. Gynther, I., Waller, N. & Leung, L.K.-P. (2016) Confirmation of the extinction of the Bramble Cay melomys Melomys rubicola on Bramble Cay, Torres Strait: results and conclusions from a comprehensive survey in August–September 2014. Unpublished report to the Department of Environment and Heritage Protection, Queensland Government, Brisbane. … then I excitedly reached for my specs. That rat represents the collective brainpower of our current crop of politicians. As such it is a symbol of the nations political extinction. Its a “rat” election, an “Extinction Level Event”. The year of the rat is no more. We must wipe out all fossils fuels to save the rest of the rats, sorry, politicians. Are we all supposed to sob uncontrollably? They’re really scraping the barrel if this is the latest climate scare. Each week our local rag publishes the same old letters from the same old people complaining about the destruction of the Earth that will occur if logging goes ahead in a small copse of trees that were always destined to be logged. A copse of trees that represents a pin head in the overall landscape of trees in Victoria alone, ‘will’ cause the destruction of the planet. This is a firm belief. Now another repeat letter writer has stated that logging these trees will cause the loss of insects (he heard it on ABC radio) and result in the destruction of the landscape and eventually the world. This too is a firm belief. I kid you not, these are the contents of actual letters written by people involved in a lobby group protesting some trees that most locals wouldn’t have know existed or ever visited, other than those gathering firewood. I’m keeping copies of all of this as a record. All of these people are ardent global warming worriers. Sometimes trees are planted to be logged when they have matured. Does anyone know the history of the patch of land and the copse concerned? Because if they were planted to be logged, then who should care when the loggers turn up as originally intended? Our area came into being as a logging town, even a railway was built in 1885 to transport logs down to the Latrobe Valley. The area concerned and another nearby have always been designated for logging. Logging still occurs all around the surrounding area to this day, yet for some reason these people have gone somewhat insane over these two locations. One copse few know about or can see and is really only accessible by 4WD and the other is along the Strzelecki Hwy where no one can see anything because of a high embankment and a very windy and steep road. The Strzelecki Hwy copse is cross-crossed by trail bike tracks and increasing undergrowth and fuel loads, hardly an ecological haven. Logging would make the area, including large adjacent forest reserves that cannot be logged, a lot safer given their location. It can’t be the trees then. It must be some sort of seen-only-once-forty-years-ago but must-be-saved-at-any-cost rare animal like a Snark. Hmm, it would be laugh if their Snark turned out to be a Boojum. Tell them you’re sending the trees to Drax in the UK to be burned for “biomass” electricity. It’ll be all good. LoL but so true! With chopping down forests to save forests, all’s good. Say, didn’t Tim Flannery claim, in ‘The Future Eaters,’ that the forests of Easter Island were denuded by islanders to make rafts to move their statues, and isn’t that deforestation now being blamed instead on Polynesian seed-eating rats? Several years ago, while visiting Perth, I recall the frenzied destruction of beautiful elegant willow trees, deemed by the politically correct dogma of the local council authority as non-indigenous invaders. I wonder in this current moment, whether the open borders globalism of those riven by identity politics and cultural Marxism now accept those poor willow trees with open arms? “They’re really scraping the barrel if this is the latest climate scare.” THere will be more to come……. Yes….I think Julie Bishop resigned due to “climate change”……WHY NOT ?? might as well add to the pile ! The ABC seems to think extermination of rats on this island is a blessing…. Old Brew you live in UK so are not to know that Melomys are different to the rats and mice of Europe. Most Melomys are indigenous. Those that are in PNG and parts of Indonesia are south of the Wallace line which is similar to most Australian birds. Melomys are in fact wuite cute. The size is between the imported rats (sewer & ship) and the imported mouse. We recently had a fawn footed Melomy (common on the coastal strip of SE Qld) about 70mm long with a tail about 110mm – rats and mice have a tail shorter than the body. The droppings are small 1-2 mm wide and 3-5 mm long. It ran into a box so I could take it to the bush at the edge of our property. I would say it might be food for the pythons and goannas around the place. Can I say again Melomys are cute unloke rats. Will somebody please call our leading mammologist Tim Flannery specializing in dead mammals. Only he can help us now. And the rats. Make him Chief Rat Commissioner. Perhaps his Rat Council can help too. I would guess that $444million might start the program. There’s no time to quibble about a few million. Rat lives are at stake! Dr Flannery might just be the man for this occasion. Note Peter Latch makes reference to him, among others. Flannery, 1995. Mammals Of The South-West Pacific & Moluccan Islands. Cornell University Press. Dr Tim might be out of his depth on many other climate matters, but on this topic his opinion should be worth something. There’s one specific mammal that the green progressivists would’nt mind going extinct – isn’t there…? I thought Flannery already was Chief Rat Commissioner. Do rats suffer from bleaching? Perhaps he can relocate his waterfront home to the island. Didn’t you read that it has almost washed away? Or is that why you suggested it as the ideal spot for him? The latter. Definitely the latter. He can then experience the sea level issue he so alarmingly warned us about while he lives on the Hawkesbury, or somesuch. It’s deja vu all over again! This phrase “They also found that M. rubicola has a distinct mtDNA gene sequence when compared to other Australian melomys” caught my eye. Why were they comparing this rat with those 200km. away and not with any 50kms. away (and upstream of any tree bearing floods). Unpublicised – champion long distance swimmers? I wonder if it was an “own goal” and they killed off the rat with their own baiting program? Maybe this is a cover up to blame “climate change” for their own incompetence? Or maybe they deliberately killed it so they could blame “climate change”? If you think I’m being too sarcastic, I have extensive experience with Leftists and know how evil and dishonest they are. Nah, no such luck. It could have been just resting. Where’s the evidence it is no more? Any fossilised bones? Maybe it got hungry and swam away — rats are pretty good swimmers. NZ saved a wallaby from extinction. I remember the roundup and re-shipping home of the saved strays. They were occupying an island near Auckland at that time. Well, that idea wasn’t accepted so we’re still stuck with millions of those pests which think our forests are Possum Ice Cream, and the Bushy Tailed Possum is an officially endangered species in Victoria. They’re now well established in the greenery within Auckland City, making pests of themselves, which they do rather well. Therefore, if youse guys ever do run out of Bushy Tailed Possums, we are keen if not eager to help re-establish them! Minimum quantity is a zillion! Thanks for that, I had no idea and may I be the first to apologise over the possum invasion, it happened before my time. The reason NZ got possums was that they were offered a choice between possums and australian politicians, and they naturally chose the less destructive (and more intelligent) offer. I thought that comment might be ‘moderated’ and was ready to defend it by pointing to the claim by Richard Marles, a Labor frontbencher, and Adam Brandt the Green about how desirable the complete shut down of Australia’s coal industry would be. Answer: You start with 2 thick planks. The Greens and Corbyn’s Labor have a problem with 4 x 2s. 4 x 4s are pretty good. They’re another common size. (Fence posts). It’s important not to take a fence. Yes, important to leave it where it is…..other ideas however seem to be pailing into insignificance…. Moving fences are not welcome. They’re almost as bad as mobile goal-posts. Remember Corbyn’s brother is Piers Corbyn. No AGW here thank you! I think that’s up there with whoever said that trans-Tasman emigration from NZ to Australia raised the IQ in both countries … Muldoon? Yep. Robert Muldoon. It’s one of things he was knighted for. Seriously (and it’s pretty hard to be serious here ), the possum was introduced to NZ’s forests sometime in the 19th C., to “establish a fur industry”. Trapping for possum skins used to be a fairly lucrative occupation, until the %#@$ing Greens wrecked the global fur industry for other reasons. The possums, which thought New Zealand’s forests are “Possum Ice Cream™” (pat pending) and still do, were left alone so of course, now the only form of predation had gone, they set about breeding and wrecking the forests. Possum damage is immediately visible and is of staggering proportions. A bit of private enterprise just after the discovery that possums, like rats, weasels, stoats and feral cats liked to eat protected native birds amd especially protected native birds’ eggs—they were caught on camera!—managed to get a sort of an industry going again. Possum-fur coats are available again. If you find one, check the label: country of origin is NZ, and check it’s Genuine Possum Fur. If it is, buy it. If you do, a forest somewhere in NZ will thank you and take it’s first steps towards recovery. And while you’re at it: buy them for all your friends and rellies too! The NZ population of possums and wallabies have genetically changed slightly from the mainland originals (so I heard), as its been nearly 150 years since Governor Grey took them across the Tasman. Yes, but it wasn’t genetically significant! Brush tailed possums are listed as rare & endangered because all them have abandoned their native habitat ! They have all moved into the green suburbs of our towns & cities. They are the thumps and bumps and growls we here at night on the roof and in the roof cavity. There is quite an effort in Adelaide to relocate Brush tail possums from urban roof cavities back to their native habitat. But it seems that the brush tail possums prefer the suburbs. decades ago there was a mob of Parma wallabies in the ‘Jock Sturock reserve’ on Monash university in North Clayton. The Parmas had become extinct in Australia in the 1890′s but were rediscovered in New Zealand on some island being an exotic pest ! A wallaby native to SA ( I forget the name ) which was also extinct here in SA was later rediscovered in New Zealand…And has been reintroduced to its native land. That figures! Possums are not thought of as particularly smart critters but they sure can survive! And in a country where there is no natural (nor even an unnatural) predator and Ice Cream grows in humungous quantities, then there is a continuous population explosion! As we live through a long cooling Pause. Off the coast of PNG. or bird attack, or storms. So what to make of this ‘news’ ? Just more poor quality propaganda ! to make us ALL feel guilty. Have to agree with all of this, even the snarky first paragraph. This is pure overreach. Sharky? What’s wrong with rat? Maybe payback for all the abuse to science heaped onto the scientific process? Take the new “collective term”: Forcing. Used by the IPCCCCC Climateriat to cover the fact that they have distorted and invented dubious sciency sounding concepts to justify their world conquering program. Sharky, totally justified to warn people that there’s a rat in the woodpile. what are you on about? Although David Maddison did some truly heroic work, the non sequitur award of the day will be presented to Mr Keith. Well done. Thank you Gee Aye. That might be a first for me? Just so normality is resumed, I think the verbiage and many of the sub comments in your text are not particularly humorous or insightful and just go to make it a bit too long. Gee Aye seems embarrassed and wants to return to normality. I am not sure what Gee Aye’s normality means, but I suspect that he does not want to be seen to pay a compliment to Jo or her work on this blog. I suspect pfutz has got his/her testosterone (or is it oestrogen), going. Suddenly come out of his/her closet with fake bravado. As a Non-Seq-Awardee I resemble that remarque. Well done — Forward with the non sequitur, Forward with the advancement of the Language! Tomo, that was meant to be a green. Leftists (US = liberals) love free tropical vacations at taxpayer expense. Why don’t they go to PNG and look for it there (where it probably came from in the first place). Personally, I think the island is too unstable to allow speciation to happen in the first place. In any case, they knew the rat was low in numbers since 1995 so why didn’t they try a captive breeding program? I bet they wanted to make a sacrifice to appease their Climate Change™ gods. A final point. Anti-science Leftists (a tautology, I know) think the climate is unchanging and it’s not. The same with species. They come and they go. That’s how evolution works. This rat was not fit for purpose so was deleted from the gene pool (on the island, perhaps not in PNG). I sent a copy to David Icke, and he provided a translation, 10 pages of it. In all of earths history extinction is the norm , survival the exception. That’s trick with man made Climate Change. Most times you have no evidence it is happening and then something like this. Oh, the inhumanity. To rats. Maybe they were all gay, LGBITQ? Nothing wrong with that of course, but it could be an real problem with small communities. What were they thinking on an island? Holidays? I don’t trust any “science” involving Leftists. As with the alteration of historical temperature data, we need to check that this rat was indeed confirmed by real non-corrupt scientists to be a separate species. Is one rat a species? Anthropocene? What’s that? If people have to make up names, they should get it right. I can still remember my childhood and I remember it was the Plastocine era. They thought it went extinct over a century ago. So I wouldn’t write the rat of just yet. The last rat I caught in a live trap I was going to try gassing with exhaust fumes as a more humane alternative to drowning in a bucket like I usually do. No, I think the car tyres did it. He was very flat, not exhausted. The only problem with DD is that it strikes more or less at random. It’s lethality is unquestionable, but there is not a high enough mortality rate for it to be reliable. Did you know, if you line up a smallish cane toad with a decent driver, they go “ping”? Not recommended with half decent clubs…. Normal rats run up drain-pipes. Tim Flimflam’s last dumb rat ran to a hot reception up my 4WD’s exhaust-pipe! Australia’s largest coal miner Glencore has succumbed to shareholder pressure to take action to address climate change, and announced it will cap its global coal output. This doesn’t sound right. Why would an investor want to restrict production? The only answer is if the same investors had an interest in shutting down cheap coal power so they could make more money out of the climate change™ sc@m that they are also invested in. I was wondering but I think you’ve nailed it. Coal limits their more lucrative revenue stream; so it’s sheer greed masquerading as altruism, yet again. And further, how Glencore has changed its tune; only a couple of years ago the company was warning us that we needed to straighten up and fly right but this decision signals that it has resigned itself to acquiescing in the free for all of financial scavengers picking the bones now the country’s irretrievably buggered. This is what OPEC have done for a long time with oil. Limit production, supply/demand forces the price up. Indonesia have plenty of coal, it just costs more to get out of the ground. China and India can also ramp up their yuck coal production any time they want, at a cost. Donald’s trade warm has slowed down the world economy, so China is knocking back coal imports because their larder is full as exports falter. Keeping the stuff in the ground shows good business acumen and it appears as virtue signalling. If I had the choice of saving the life of a Green or a politician and a rat, I would choose the rat. Not much point. All three will bite the hand that feeds them. Is that three people or one? A Green, a politician and a rat walk into a bar. It doesn’t matter what they want. You know it’s going to cost you. Ill have some ratatouille with that! Absolutely wonderful! A real physicist, not a pretend psycho scientist from the Church of Climate Scientology. He is labelled a sceptic as every scientist should be. Nothing is true until it is proven beyond the shadow of a doubt and nothing in this man made Global Warming is true. Since Rene Descartes, a rational scientist is a sceptic and the diametric opposite of an acolyte, true believer or opportunist. At 79 years, he is not the slightest bit concerned about working his way up the ladder or playing politics with science. “atomic physics, optics and spectroscopy. He is the Cyrus Fogg Brackett Professor of Physics, Emeritus, at Princeton University”. Now try to fool him with your graphs and pictures of lonely rats and starving polar bears. As I commented on Watt, exactly where did the ‘killed by climate change’ statements come from? I had a look at the government statement that declares the little bugger 100% mort and the word ‘climate’ is nowhere in the entire body of text. All the claims that Climate Change(tm) was to blame seem have been made by third parties like the Wilderness Society but don’t actually go into details as to which actual bit of climate changed to kill these little beasties. To recap, this is a group of rodents that apparently lived on a glorified sandbar that hardly anyone actually seemed to visit. Correct me if I am wrong but we don’t even have hard proof as to when these rats arrived on the island or even if they are the same rats, and we don’t even know the method of their death. So much assumed. So little proven. Maybe they were dropped off by a cruise ship and ran out of pina coladas and nuts? Maybe it makes sourcing IPCC report info more efficient? You can imagine the happy hours – greenies with paspalum sandles & suby outbacks and end-of-the-world spivs in ray bans and corporate jets….. If the rats in the cay have died out it has nothing to do with Climate Change. Who first called it as a consequence of Climate Change? I don’t know and I think that is wrong. Nothing to do with Climate Change. Null hypothesis! Last greenies to visit, left their cat there. ! It’s not climate change™ to blame anyway but government incompetence for firstly failing to start a captive breeding program earlier and secondly, when it was recognised how critical the situation was in 2014 with only about ten individuals left, it took FIVE MONTHS to get permission to capture the remaining ones and by the time permission was granted, there were none left. Rats are endemic in human society. I have read that you are never more than 40′ from a rat. They carried the Black Death and killed hundres of millions of people. Like rats. They are very dangerous vectors for many diseases and the enemy of mankind. So here we have a government body spending our money to save a few rats unfortunate enough to be on a tiny desert island simple because they are allegedly slightly different from other rats. That used to be called natural selection. Personally, they should not have been rescued at any cost. Snakes and rats and spiders were never part of any island eco system. That’s why Ireland and New Zealand do not have snakes. Nothing to do with St. Patrick. The world spends fortunes trying to eliminate rats in an endless battle against the vermin, especially from island communities where they devastate the wildlife and a few caring government funded ecologists think they are essential for our well being and want to rescue them. Why? I declare shennanigans. Macquarie Island, the preferred gulag for climate reprobates, has been rid of rats at great expense to the Australian taxpayer and now we are to husband a rat population elsewhere; really, we need to stop hunting down these examples of policy cognitive dissonance as some sage green schoolchild may be offended by it. There is a rat baiting program ‘on hold’ at Lord owe island where many indigenous native species have been wiped out by rats.. The hold up is due to some locals thinking the poison might disturb the eco-system ! And now we are protecting a few rats in case they die out on an island? There was a time that was considered a good thing. Like now. Yes but you keep electing them…tsk…..
Somebody should investigate how this species of rat managed to survive so long. It’s a miracle really. It is not a species. It is just a rat that got transported from the Fly river delta (PNG) to this little island. However it seems miraculous that the rats survived on the tiny cay for a number of years. What did they eat? The less they eat the longer they live according to a well known study undertaken on rat populations in the lab. Is that where Dr Michael Mosely gets some of his ideas? He is all for calorie restriction. I just ask why? Why deny your self pleasure now. My friend has had had a serious stroke at the age of 80. Is that what we are trying to live for? The vast majority of the Earth is not being measured by weather stations. As we try to compare temperatures earlier in time, the poor coverage grows radically worse the farther back in time we go toward 1880. The Earth’s surface measures 196.9 million square miles. Today, there are an estimated 10,100 weather stations world-wide, in addition to 1,000 free-floating buoys completely useless for measuring climate change.. Global warming was once a worry about too much heat. It implied that man-made carbon emissions had so warmed the planet that life as we knew it would soon be imperiled without radical changes in consumer lifestyles. Yet in the last 30 years, record cold spells, inordinate snow levels and devastating rains have been common. How to square that circle? Substitute “climate change” for global warming. Presto! Any radical change in weather could be perceived as symptomatic of too much climate-changing carbon dioxide in the atmosphere. Beware of euphemisms. Radical changes in vocabulary are usually admissions that reality is unwelcome or indefensible. That’s over forty million olympic swimming pools; why can’t they stick to the standard unit of area? And here I was thinking that the standard unit of area was the football field. When did it change? Millions are facing disruptive snow and ice from Philadelphia through Chicago and Minneapolis as a far-reaching winter storm pounds the northeastern and midwestern United States. School closures and travel delays were widespread on Wednesday morning as snow ramped up across the regions. Snowfall rates of 2-3 inches per hour were observed from south-central Pennsylvania into northwestern Virginia with occasional thundersnow. The same storm set to bring feet of snow to parts of Arizona and significant snow to the rest of the Southwest late this week will swing onto the Plains and evolve into a blizzard over part of the north-central United States this weekend. The storm from Wednesday has pushed Minneapolis/St. Paul International Airport over the top for the snowiest February on record. The prior February snowfall record for Minneapolis was in 1962, when 26.5 inches of snow fell. All due to CO2 driven global warming ! I think most folks in North America are missing their share of global warming and want it back ASAP. The Salvation Army, expecting to stay open for another week of freezing temps, needs volunteers. “Our biggest need is volunteers and blankets,” Reedy said. The icy conditions also have put her volunteers at risk. A knockout blow for a popular local bridge. Our recent record cold snap is part of the reason. In other weather news, a winter storm warning is in effect for Riverside, San Diego and San Bernardino counties through 1 a.m. Friday. If it falls, forecasters predict, the snow could reach as low as the 2,000-foot level on the San Jacinto Mountains, although clouds may prevent people from seeing snow-capped peaks until Friday, Connolly said. High temperatures through Thursday should be about 55 degrees and low temperatures may be about 41 degrees. This season, Palm Springs has received 7.21 inches of rain — more than double the average of 3.5 inches through Feb. 20. I have to repeat, this is the coldest summer I can remember in Melbourne. A lot of cold days. One or two days over 30C in January and February. Cloudy. Grey. Nothing like the summers I knew. No long dry hot days close to 40C and lasting for a week or more. One January where only three days were under 30C. It was shocking that children started school in such heat in early February but this year the automatic thermostat turned on the gas heater, which was a bit of a shock. Global warming? Bah! It looks like blowing up power stations works. I’m in complete concurrence with TdeF as there’s only been two or three days this summer on which I have not been able to sit and work in the shed during the day; in each of the preceding five summers there’s been roughly twenty such days. In mid winter it’s too cold in the shed for about the same number of days; with any luck this will be a correspondingly mild winter, well a lot of luck I imagine. But surely the cool of the aircon and the beer compensates……? and then there is the Test to watch as well. My recently departed Dad used to watch the Tests , mum hated the drone of the commentators, so the compromise was having the sound off. SOUTH LAKE TAHOE (AP) — Record-cold weather followed the latest snowstorm into the Sierra, where the overnight low dropped to minus 13 degrees (minus 25 degrees Celsius) at South Lake Tahoe. The National Weather Service says the new record low set early Tuesday along the Nevada-California line smashed the previous record of minus 8 degrees (minus 22 C) for the date set in 1990. The service forecast highs in the mid- to upper-20s at Tahoe on Wednesday before lows drop to single digits Wednesday night, then back below zero Thursday night as another winter storm system makes its way through the region. In eastern Nevada, the service expects lows of minus 4 to minus 6 (minus 20 to 21 C) in White Pine County along the Utah line late Tuesday or early Wednesday. After green saint Ross Garnaut and his mates got finished with the Fly River who could blame even rats for wanting to leave? MARINE MOUNTAIN WARFARE TRAINING CENTER, Calif. — Hunkered down behind a wall of snow, two U.S. Marines melt slush to make drinking water after spending the night digging out a defensive position high in the Sierra Nevada. Their laminated targeting map is wedged into the ice just below the machine gun. Lance Cpl. Reese Nichols, from Pensacola, Florida, and Lance Cpl. Chase Soltis of Bozeman, Montana, dug their defensive position a day ago, and they’ve been watching all night for enemy movement, while using a small burner to melt snow to stay hydrated. The cold and wet conditions force the Marines to use snowshoes and cross-country skis to get around. They wrap white camouflage around their weapons, struggle to keep the ammunition dry and learn how to position their machine guns so they don’t sink into the powdery snow. Summary: With data and modelling from almost 8,000 coal power plants, researchers present the most comprehensive global picture to date of climate and human health impacts from coal power generation. Coal-fired power plants produce more than just the carbon dioxide that contributes to global warming. When burning coal, they also release particulate matter, sulphur dioxide, nitrogen oxide and mercury — thus damaging the health of many people around the world in various ways. To estimate where action is most urgently required, the research group led by Stefanie Hellweg from ETH Zurich’s Institute of Environmental Engineering modelled and calculated the undesired side effects of coal power for each of the 7,861 power plant units in the world. Reducing the negative health effects of coal power generation should be a global priority: “But further industrialisation, especially in China and India, poses the risk of aggravating the situation instead,” write the researchers led by Hellweg in their article. The initial investment costs for the construction of a coal power plant are high, but the subsequent operating costs are low. Power plant operators thus have an economic interest in keeping their plants running for a long time. “The best option is therefore to not build any new coal power plants. From a health and environment perspective, we should move away from coal and towards natural gas — and in the long term, towards renewable energy sources,” says Oberschelp. A car made from waste plastic has been forced to abort its mission to the South Pole because of bad weather. Solar Voyager was set to be the first solar-powered expedition to reach the world’s most southernmost point. But despite it being Antarctica’s summer, unexpected heavy snow has meant progress has been slow, and now the team have had to turn around. The team from Holland say they’ve still achieved their main mission: to prove plastic waste can be put to good use, though they’d rather people avoided using single-use plastic altogether. So if anyone wants to drive nearly to the South Pole in freezing conditions in a plastic car, there is a use for plastic waste? Presumably the manufacture of the car used energy produced from renewable sources and it’s transport to Antarctica was by sailboat. Greens are terrorists in politicians clothes. They ought to be treated as such. He might have had a few weird ideas, but sayonara freedom of speech…..
Well, we know we live in a marxist dictatorship, I suspect he was sitting right on the raw nerve with some of the stuff he goes on about…..they dont like it. I retch when I see that….scary stuff…..the iron fist of censorship in the govt glove…. Australia is having the squeeze applied. The fact of the gesture is evidence that we’ve mismanaged the relationship and now the first cog has been moved under the ratchet. Maybe the 5G ban on Huawei triggered it but if you look deeper you’ll ask where is the Australian hi tech electronics industry capable of producing a home grown independent Internet of Things without the vulnerability of needing to incorporate foreign made core devices? Well we defunded that sort of research decades ago and today’s CSIRO is a hollowed out spent force and the painful consequences are finally becoming apparent. I guess even the Chinese communist party governmnet cuts off it’s nose to spite it’s face occasionally. to be fair, the chinese have been developing plasma reactors as heat sources…no coal required…..
About a week ago, on channel 9 Melbourne, I saw part of a story about research being done on Green Sea Turtles on the Barrier Reef. ( The GBR ). Unfortunately I did not see the whole story , as I began yelling at the TV , and my wife suggested that perhaps I should leave. I did leave, but not before I gained an understanding of the content of the propaganda, sorry, news item. Apparently global warming is having an impact on the development of the eggs of the Green Sea Turtle, causing more females that males to hatch from any clutch of eggs. temperature remains pretty constant. Turtles know this, that is why they bury there eggs, in moist sand, at a depth that will not be influenced by solar radiation. Turtles have been doing this for some hundreds of thousands of years, and by all accounts it has been successful. The researchers, apparently Ph.D. students, dig the eggs up, move them to a control site, and pour water from a plastic water can on the displaced clutch of eggs, in varying amounts. That is as far as I got before loosing it. The land hasn’t been properly surveyed to the north on the PNG mainland, because its PNG- and Australian researchers have more difficulty going there. It’s highly likely the species, or the subspecies as it more likely is, exists to the north on or about the PNG mainland; even the earlier researchers themselves noted there should be more surveys done to the north before classifying it as occurring only on the only island where it has been documented. Also, boats carrying dogs regularly land on these small islands, with predictable results on wildlife. People carrying dogs to remote islands have nothing to do with climate change but this is conveniently ignored, the whole farce is therefore a story based on geographical and political boundaries necessitating where researchers can go and how they classify extinction, which in this case qualifies as a ‘local extinction’, which is itself an oxymoron. Politicians then take over and complete the story. The proposed Presidential Committee on Climate Security is being spearheaded by William Happer, a National Security Council senior director. The White House is working to assemble a panel to assess whether climate change poses a national security threat, according to documents obtained by The Washington Post, a conclusion that federal intelligence agencies have affirmed several times since President Trump took office. The proposed Presidential Committee on Climate Security, which would be established by executive order, is being spearheaded by William Happerr, a National Security Council senior director. Happer, an emeritus professor of physics at Princeton University, has said that carbon emissions linked to climate change should be viewed as an asset rather than a pollutant. The New York Times cites a 14 February White House memo, reporting that the panel will consist of 12 members, including Happer, which the paper describes as a “climate denialist” whose views are “sharply at odds with the established scientific consensus”. Happer has suggested that higher CO2 levels would be beneficial, notes the Guardian. Other outlets covering the news, including Reuters, Axios, DeSmog and Vox, which runs with the headline: “Trump’s pick to chair new climate panel once said CO2 has been maligned like ‘Jews under Hitler’”. Separately, a feature in the Independent reports that military leaders “from the US to the Netherlands…are speaking up on climate change” and the threat it poses to security. The White House is readying a presidential panel that would question U.S. military and intelligence reports showing human-driven climate change poses risks to national security, according to a document seen by Reuters on Wednesday. The effort comes as President Donald Trump seeks to expand U.S. production of crude oil, natural gas, and coal, and unwind regulatory hurdles on doing so. The panel, to be formed by an executive order by Trump, would be headed by William Happer, a retired Princeton University physics professor currently on the White House’s National Security Council. The White House is holding a meeting on Feb. 22 in the situation room to discuss an upcoming executive order by Trump to set up the committee, made up of 12 or fewer people, said the document, dated Feb. 14. The document was first reported by the Washington Post. Happer, who does not have a background in climate, has served on the NSC since 2018 as deputy assistant to the president for emerging technologies, and complained that carbon dioxide emissions have been maligned, a position strongly opposed by a vast majority of climate scientists. Francesco Femia, the co-founder of the Center for Climate & Security, a non-profit research and policy group, called the panel a “sham committee” that could put a chill on further analysis of climate risks from some members of military and intelligence agencies. “I am worried there will be a reticence among some in the future to include those risks in their public reports for fear of having to deal with this political committee in the White House, because ultimately the heads of departments and agencies serve at the pleasure of the president,” Femia said. I must admit something that is very embarrassing. I didn’t read your post before commenting. Now, sixteen hours after the first comment early this morning I went back and found two photographs one superimposed on the other. In the background photo is the entire story. The photo of the rat, O.K. I get that. You call That an Island? ‘ how much Government money has been spent on Rat Island? However, Trump and his cabinet have dismissed several federal government reports that said climate change is worsening and already threatens public health and the economy in the US. In 2017, Happer told the Scientist that climate change research has become a “cult movement”. Is that all so far? Well at that rate it will take centuries for the so called climate change catastrophe to impact the world in some serious way. We have plenty of time to switch to some yet unknown power source that will solve all our issues. That is if mankind is still around and we haven’t nuked ourselves to death or some killer asteroid has hit us. Then again we all know that it’s just a scam so it will continue as long as there is money in Green Energy. “Unless you seek out Breitbart on your computer, you’re probably not even going to know what the other side is saying,” Logan said on the “Mike Drop” podcast. Hannity called her brave for the interview, which may mean career suicide for her. Garbage propaganda from fire proof bloody academics who will never feel the pain of the hiuely increased costs of ‘renewable’ power supply .. This was a response to Comment #44 by Pat. Is she allowed to visit Australia? Press Briefing: Jussie Smollet is under arrest and in custody of detectives. At 9am at #ChicagoPolice Headquarters, Supt Eddie Johnson, Commander of Area Central Detectives Edward Wodnicki will brief reporters on the investigation prior to the defendants appearance in court. This week, Ms Pelosi quietly deleted her tweet. Ms Harris said “the facts are still unfolding” — and declined to comment further. Mr Booker said he would wait until “all the information actually comes out from on-the-record sources” before weighing in again. He also said that his story would have been more readily accepted had he said the culprit was “a Muslim or a Mexican or someone black”. With Smollett now the one facing charges, some say this is an example of how quickly narratives can be asserted and weaponised in the era of social media. In regard to the apparent Smollett hoax, the chronology of its coverage is telling. Immediately upon news breaking of the purported incident, the ABC went with two stories, one on its website plus an audio interview with an Empire executive who left no doubt he believed every word and, predictably, saw Smollett’s ordeal as an example of the further mestastising of the Trump cancer. It’s worth hearing, especially the compere’s editorial sigh at the item’s conclusion. University researchers and academics do not typically move this quickly: the cadence of their work is usually dictated by the need for detailed analysis, papers and conference presentations. But when an ACT research team led by Andrew Blakers and Matthew Stocks this month announced the result of research about the shift to renewables and its impact on emissions, they were quick to respond. Blakers and Stocks’ research came to two conclusions that are important to the current debate about the energy transition: mainly that shifting to 100 per cent renewables is technically feasible, and at the current rates of deployment, enough wind and solar could be built by 2032, just 13 years away. They were not particularly controversial observations, but given the constant push back by conservatives, ideologues and fossil fuel promoters that a 100% renewables is impossible, and repeated assertions that wind and solar can never be built quick enough, they were important points to make. ***What upset their colleagues, and which provoked such a rapid response in social and mainstream media, was the claim that this transition was largely achievable if the government “got out of the way” and could actually deliver the country’s Paris commitment for economy-wide emissions reduction targets 5 years early. The researchers, including Blakers, Stock, Jotzo and more than 40 other academics, local and international experts, regulators and government representatives, have now grouped together – following a three-day symposium in Canberra – to argue that yes, a quick transition towards 100 per cent renewables is possible and it will play a central role in emissions reductions. It is not sufficient, they say, to simply build enough wind and solar to meet the supply needs of the economy. Market reform is desperately needed to keep up with technology changes and reflect the different capabilities of the new equipment. “The symposium offered a very optimistic picture of what can be done,” Jotzo says. The conclusions were that it was not quite as simple as asking the government to get out of the way. If anything, a lack of action could impede progress and create particularly messy transition. Pat, you deserve a valour award for your repeatedly ploughing through reneweconomy articles and reporting on the details of the fevered schemes of the demented green nutjobs lionized there. I have a Jussie Smollett/ABC comment in moderation. accidentally typed “GAIL Roberts” for ABC America’s “ROBIN Roberts”. Gas hobs could be banned from being installed in new homes within seven years over fears that they are harming the environment. Under new plans unveiled on Thursday by climate watchdogs no new homes will be connected to the gas grid after 2025 at the latest, in order for the UK to meet its legally binding climate targets. The proposals, from Government’s official climate advisers, would call time on new gas radiators, boilers and cooking hobs. ***The move away from gas hobs is likely to disappoint many home cooks who prefer them to electric as they find the heat is easier to control. Developers must be forbidden from connecting homes to the gas grid and should instead be forced to install low-carbon heating systems, according to a report by the Committee on Climate Change. The move would mean that newly built homes would not be able to have gas stoves and would need to be fitted with alternatives such as induction hobs. In cities, new housing estates and flats should be kept warm by networks of hot water, says the report. The water could be heated by waste heat from industry. An alternative approach is to use heat pumps, which draw warmth from the sea or lakes; or burn gas from waste. The report, from the independent Committee on Climate Change, recommends these changes are made to new homes at first because it’s much more economical that way. They say it costs £4,800 to install low-carbon heating in a new home, but £26,300 in an existing house. The committee wants the government to treat renovating the UK’s housing stock as a national infrastructure priority, akin to widening roads. The report says upgrades and repairs to existing homes should include plans for shading and ventilation to combat the extreme heatwaves expected in future. ***The chair of the Committee, Lord Deben, is being investigated by the Lords Standards Committee to see if he has breached rules by not declaring income from firms that benefit from pro-active climate policies. Lord Deben says he has followed advice on the rules. “Britain’s extensive gas network infrastructure means that the public and the wider economy are able to access the energy they need quickly and reliably throughout the year, as and when they need it. It’s vital that we decarbonise the gas we are using so we can reach our climate change targets, whilst still being able to take advantage of those important attributes. Overall, Spain’s plan will generate investment worth 200 billion euros, the government said, and should cut its reliance on imported energy to 59 percent from 74 percent over the decade. Sanchez’s Socialists are leading in opinion polls ahead of the election but the polls forecast the party will fall well short of a majority in the 350-seat parliament. Farrell, a fashion designer, said that she had helped produce Williams’ line, which is dedicated to social justice and sustainability, and that she had not been intending to protest at the event. Climate Change is not mentioned sufficiently often in the classroom? Ah yes, The Guardian. A federal judge has dismissed a lawsuit by two Pennsylvania boys and an environmental group seeking to stop U.S. President Donald Trump from rolling back regulations addressing climate change, saying the court does not have power to tell the White House what to do. A committee of the European Parliament on Tuesday endorsed opening talks. Adopted by 21 votes to 17, the resolution by the committee for international trade (INTA) empowers the European Commission to discuss two trade deals, respectively designed to lift tariffs and iron out bureaucratic hurdles between the two blocs. It goes to a full parliamentary vote in mid-March. The Democrats’ Green New Deal calls for a fully renewable electric power grid. Regardless of the economic or political challenges of bringing this about, it is likely technologically impossible. An electric power grid involves second-by-second balancing between generated supply and consumer demand. In the case of a sudden imbalance—such as from the loss of a generator’s output—all the remaining generators on the grid instantaneously pool together. Each one pitches in a small part of the required power to make up for the lost generator fast enough to keep supply and demand balanced. This doesn’t work for wind and solar because you can’t spontaneously increase wind or sunshine. Hydro power is limited and unevenly distributed around the country. And for safety reasons, nuclear power—even if the Green New Dealers accepted it—can’t be cranked up to neutralize imbalances. Nor can consumer demand be suddenly reduced enough. Fossil-fuel turbines, by contrast, very naturally compensate for sudden supply outages. The inertia of the spinning mass of rotors provides the extra energy needed to compensate for the loss for the first few seconds. (Wind-rotor inertia is too short-lived.) Meanwhile the generators’ on-line reserve capacity kicks in, giving a rapid boost in power output to prevent the turbines from slowing down. That substitute power, called “governor response,” lasts as long as 15 minutes. During that time a single replacement generator ramps up to compensate entirely for the loss. All the turbines on the grid are thereby restored to their original speed, and the governor response is rearmed for the next disturbance. We’ve got ourselves another Convoy. (In case you missed it as I did). “United We Roll left Red Deer, Alta., on Valentine’s Day, intent on bringing a message to the federal Liberal government that “Pipelines need to be built. Bill C-69 and 48 are obviously a problem. And (so is), the carbon tax,” said one of the organizers, Jason Corbeil, referencing federal legislation seeking to change the environmental review process for energy projects and ban oil tankers from British Columbia’s north. Wasn’t it last year that we were told that something like 50% of all invertebrates had dies since 1970? If this is the poster extinction, they have some explaining to do. In Nat’l Geo’s shrill coverage of this, here; https://news.nationalgeographic.com/2016/06/first-mammal-extinct-climate-change-bramble-cay-melomys/ . . they attempt to connect SLR to the shrinkage of the cay from 9.8 acres to 6.2 acres, over the past 2 decades. They acknowledge that sea level has only risen “by almost eight inches between 1901 and 2010, a rate unparalleled in the last 6,000 years. And around the Torres Strait, sea level has risen at almost twice the global average rate between 1993 and 2014.” Where’d they get that last bit from?? So anyway, in the past 20 yrs there’s maybe been a couple of inches+/- of SLR. That’s not going to be the driver in the shrinking of the cay. But then they go this extra step, seemly claiming that this is all “anthropogenic climate change-driven sea-level rise.” Since 1901? Is anyone actually claiming that most of SLR over the past century+ was caused by AGHG emissions? Would like to see a climate scientist actually sign their name to such a statement. The World spent $1,000,000,000 on rat poison last year, so the odds are definitely stacked against the rats. The weather or climate are one of their smallest problems as they are imbued with native cunning that has kept them going for millions of years, unlike Warmistas and Greenies. It’s hard to see how anyone can claim climate change is realistic factor given the description contained here! If by freak chance any land animal does establish on a cay, every day is always russian roulette. The usual height of 1.5-3m is fixed by the processes of accretion etc. so a moderately rising sea level is of no consequence, and “Even fairly large cays are vulnerable to complete destruction by severe hurricanes or typhoons” – they always have and always will be. Seems the eradication was intentional owing to the destruction of the NATURAL flora and fauna. The answers to what happened to the rat are well covered here is Paul Homewoods short article. It probably got eaten by the birds!